How to Really Prevent Persistent Tonsil Stones? Persistent tonsil stones occur when food particles and other forms of debris accumulate on the surface of your palatine tonsils. These lymphatic organs are located on either side of the back of your throat. They are responsible for filtering lymphatic fluid and for trapping incoming pathogens such as viruses, bacteria, and fungi. Unfortunately, excessive amounts of debris and microorganisms can become lodged in the surface of your tonsils. Once this accumulation begins to decay and calcify, it forms pale, oval-shaped tonsil stones that are difficult to treat because they often return. The tonsils’ superficial layer of mucosa is filled with pits and channels where materials are trapped. These crevices are referred to as the tonsillar crypts, which vary in size depending on an individual’s throat composition and age. Tonsil stones, also known as tonsilloliths, are created when trapped debris hardens in the tonsillar crypts. This is especially common in those who suffer from chronic tonsillar inflammation or from repeated episodes of tonsillitis. Although tonsil stones rarely create significant medical complications, they can persist despite your best efforts to prevent or to treat them. Medication such as antibiotics may reduce your tonsil stones at first, but it cannot serve as a permanent cure for the accumulation of other debris such as food particles or excess mucus. As a result, once medication is discontinued, your tonsil stones will quickly return. Persistent tonsil stones are bothersome, and they may occasionally lead to unpleasant symptoms. If you are experiencing a chronic sore throat, earaches, difficulty swallowing, or persistent bad breath, you may be suffering from especially large or solidified tonsil stones. Maintaining healthy habits such as good oral hygiene and a balanced diet may help prevent tonsil stone formation for some people. However, having your palatine tonsils surgically removed is the only certain way of preventing or completely removing tonsil stones. This procedure is called a tonsillectomy and may be performed by a specialized surgeon. If you are concerned about persistent tonsil stones, see your doctor. He or she can remove any visible tonsil stones during your visit and can suggest treatment methods to reduce any discomfort you may be experiencing. If these methods are not effective, you may need to consult an ear, nose, and throat specialist for further evaluation and for potential surgery. 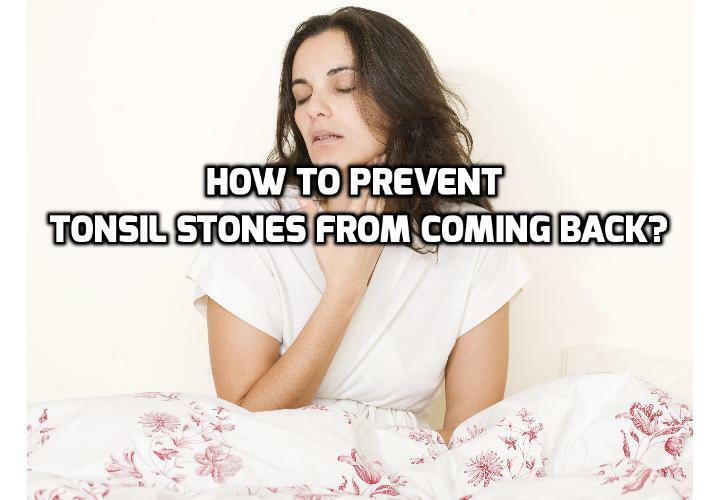 Watch this Video – How to Prevent Tonsil Stones from Reoccurring? Why a Gluten Free Diet can Help Thyroid Health? Previous PostPrevious What Causes Tonsil Stones Bad Breath?